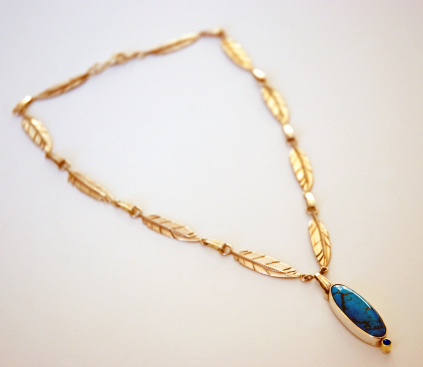 > SCROLL DOWN to the bottom of the page to view a slide show demonstrating details of the necklace. 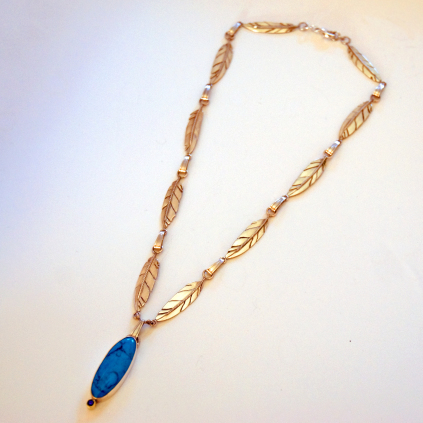 Jeweler Zhaawano honors his precious link with the culture of his Anishinaabe ancestors with this elegant chain necklace, consisting of handmade eagle feather links of 14K yellow gold. 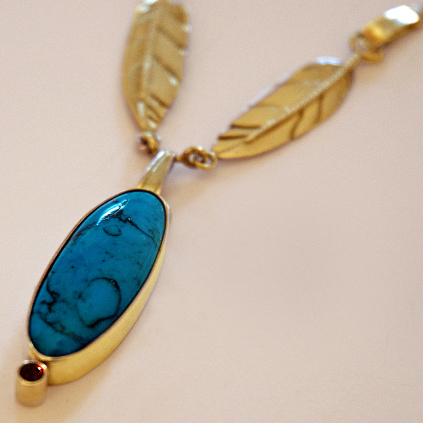 The necklace features a gold 14K pendant holding a 10 x 30 mm oval-shaped turquoise. A 3 mm brilliant-cut blue sapphire set in 14K gold accents the graceful stone with the color of the sky. The necklace design depicts a celestial scene, inspired on the Anishinaabe creation story of Turtle Island (North America) as we know it. “The first mother of the Anishinaabeg was once an AADIZOKAAN, a supernatural being residing alone in the sky. Her name was GIIZHIG-OO-KWE, or Sky Woman. GICHI-MANIDOO, the Creator of Earth and Skies, pitying her loneliness, sent a male aadizookaan to Sky Woman to keep her company. ANIMIKII (Thunder), for that was his name, traveled to the sky lodge of GIIZHIG-OO-KWE and from the union that took place were born the ANISH-I-NAAB-EG (a twin brother and sister), whom she planned to place on the back of a giant MIKINAAK (snapping turtle). But first GIIZHIG-OO-KWE had to convince MIKINAAK to lend his back to the re-creation of the world, because at that time the world was inundated with water below her and most animals had been drowned in the Great Flood that had hit the first world. As Sky Woman noticed that a few animals had survived the flood she called to her aid the giant turtle. He came to the surface so that she could sit on his back and call others to her side. Maang (the loon), Amik (the beaver), Nigig (the otter), and Wazhashk (the little muskrat) were among her assistants. That day, long ago, she spoke to the water animals as follows: 'I don't have all the powers of creation that Gichi-manidoo has. But I am a female spirit and I have a special gift. I have the power to recreate. I can recreate the world Gichi-manidoo created, but I can't do it by myself. I need your help. I need you to dive deep. I need you to bring me a handful of the original soil made by Gichi-manidoo. The soil will be the seed I use to recreate the Earth. All day long the water animals took turns trying to reach the soil covered by the great depth of water but to no avail. At the end of the day it was only Wazhashk the little muskrat, not used to swimming in deep water, who had not given it a try. The brave little animal decided that with no one else available to help it was up to him to do the job. He took many deep breaths and dived down and down. As he finally came back to the surface Wazhashk had clutched in his paw the soil from the bottom of the sea. Gratefully GIIZHIG-OO-KWE took the soil, dried it and breathed life into it, then rubbed it on the turtle's back. She rubbed the soil round and round and as she did so an island took shape above the water. GIIZHIG-OO-KWE continued to move over the new soil. She walked in wider and wider circles; some say it took her 14 summers to complete the job . And so the Earth was recreated. Forever after the Anishinaabeg called the world MIKINAAK-OO-MINIS, or Turtle Island. Once the new island was complete, GIIZHIG-OO-KWE nurtured the twins to manhood and womanhood, and then, as her purpose and nature were finally fulfilled, she ascended back into the sky, where she changed her name in WEZAAWI-GIIZHIG-OO-KWE, Yellow Sky Woman, and became known as NOOKOMIS DIBIK-GIIZIS, Grandmother Moon. From here on, Nookomis Moon watched over her children by night; by day MISHOOMIS GIIZIS (the Sunfather) and OMIZAKAMIG-OO-KWE (the Earthmother) took care of them. And Nookomis’ existence, her gift of life, and the primacy of women are still remembered by the Anishinaabeg each time Dibik-giizis, the Night Sun shines on their precious island-home. The gold feathers symbolize the spiritual journeys of Yellow Sky Woman in the sky and her descent to the newly-created earth in the form of a giant turtle. 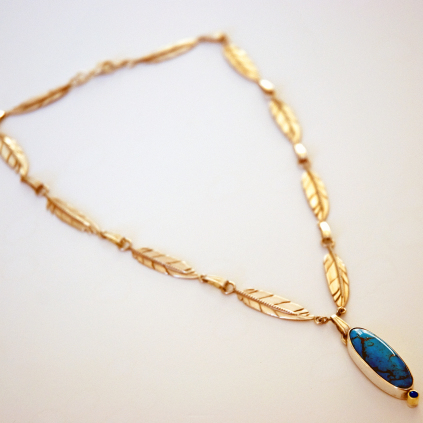 The shape of the turquoise refers to the turtle; the dazzling blue color of the stone reflects the blue of the sky, home of Sky Woman, as well as that of the sea, home of the turtle. The dark blue sapphire set in 14K yellow gold represents the night sky and the moon, the current home of GIIZHIG-OO-KWE, beloved creator and grandmother of mankind."